Qinghai slopes from west to east and from north to south. The mountains of Qilianshan, Kunlun and Tanggula form the basic spinal terrain of Qinghai. Around these mountains are a maze of rolling hills, plateaus, deep valleys, sparkling waterways and basins. The Meigonghe River, Southeast Asia’s largest international river, is in this province. 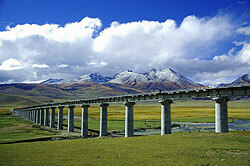 The rivers and lakes in the southern part of Qinghai originate from its snow-capped mountains. Ethnic groups—43 of them—account for almost half Qinghai’s population. So the region has rich traditional handicrafts, such as Tibetan knives, colourfully painted eggs and Qilian jade. Places of interests in the main city of Xining include the Great Mosque of Xining, as well as the North Mountain Temple, both examples of the diverse cultures in the area. Stepping away from the city, great places to visit are the Tibetan Kumbum Monastery, featuring a hall of yak butter sculptures. Qinghai Lake, China’s largest saltwater lake, is located on Qinghai-Tibet Plateau, the world’s highest and largest plateau, also known as “The Roof of the World”.